Submitted for your approval, or at least your analysis: Jordan Peele is the 21st-century Rod Serling we need in this era when “the middle ground between light and shadow” gets awfully spooky and calls for pointed scrutiny. Peele, the executive producer, host and narrator of the upcoming CBS All Access reboot of “The Twilight Zone,” delivers his sharp social commentary with bloodied golden scissors in “Us,” his terrifying and thought-provoking new horror movie. “Us” opens in 1986 – and hunting for ‘80s Easter eggs is one of the many surprisingly satisfying treats Peele has in store for film buffs – as young Adelaide Wilson (Madison Curry) wanders away from her bickering parents at a boardwalk carnival, ventures into an eerie old house of mirrors and has a horrifying experience that leaves her traumatized. 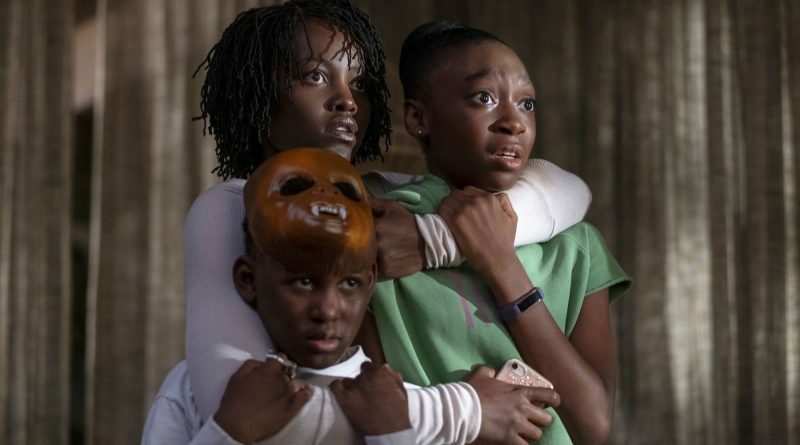 In the present day, grown-up Adelaide (Oscar winner Lupita Nyong’o, who earns more awards consideration with her electrifying dual performance), her husband Gabe (Winston Duke), their teenage daughter Zora (Shahadi Wright Joseph) and their preteen son Jason (Evan Alex) are a comfortably well-off family heading to their California summer home for some relaxation. But Adelaide becomes agitated when Gabe arranges for them to meet their friends the Tylers – conspicuous consumers Josh (Tim Heidecker), Kitty (Elisabeth Moss) and their twin teen daughters (Cali and Noelle Sheldon) – on the same Santa Cruz beach where she experienced her childhood trauma. Peele ratchets up the sense of foreboding with a series of bizarre coincidences, culminating in the arrival of a shadowy foursome in the Wilsons’ driveway. They are shocked to come face to face with a family of disturbing doppelgangers, dressed in red coveralls and brandishing golden scissors – deadly sharp shears that they fully intend to use on their counterparts. The horror auteur delivers the anticipated cat-and-mouse game, making the literal shadows especially inky and the lights blinding as he uses jump scares, sudden violence and gory bloodshed to keep the tension levels unnervingly high. As with “Get Out” – and far exceeding the towering expectations and ambitions of his stunning directorial debut – “Us” is so much more than your standard horror flick. Expertly twisting and turning through a daring plot streaked with welcome dark humor, the movie makes keen observations about the modern-day American experience, including the gulf between the haves and have-nots and the fear of outside threats vs. the obliviousness toward internal dangers. While “Get Out” delivered much of its satirical horror on race with the force and focus of a bullet, Peele takes a more subtle and scattershot tact for “Us.” He offers up incisive commentary on morality, religion, parenthood, childhood, consumerism and more that will keep moviegoers thinking and talking amongst themselves for hours after the film ends – and enough indelibly creepy moments that the icy chills will still be gripping them hours later, too. In this era of sequels, reboots and cinematic universes, Peele is creating a breakout reputation as a true original who is bringing back the element of surprise to his films. I never knew what was going to happen next in “Get Out” or in “Us,” and for a diehard cinephile, that’s such a gift – a bloody, scary, wonderful gift. Even Rod Serling would be impressed.